You can find this template at your local quilt shop. If they don’t have it, they can order directly from United Notions. Since I have a tiny bit of an obsession with the fresh new fabric line, Spring House, from Stephanie Ryan I decided to use it for this project. This quilt could not be easier. I started out making a table runner and ended up turning it into a quilt. Using the 2¾” solid strips and the 2½” print strips make 2 of the following strip sets. Press the seams toward the print fabric strips. Using the 2¾”w print strips and the 2½”w solid strips make 2 of the following strips sets. Press the seams toward the print fabric strips. 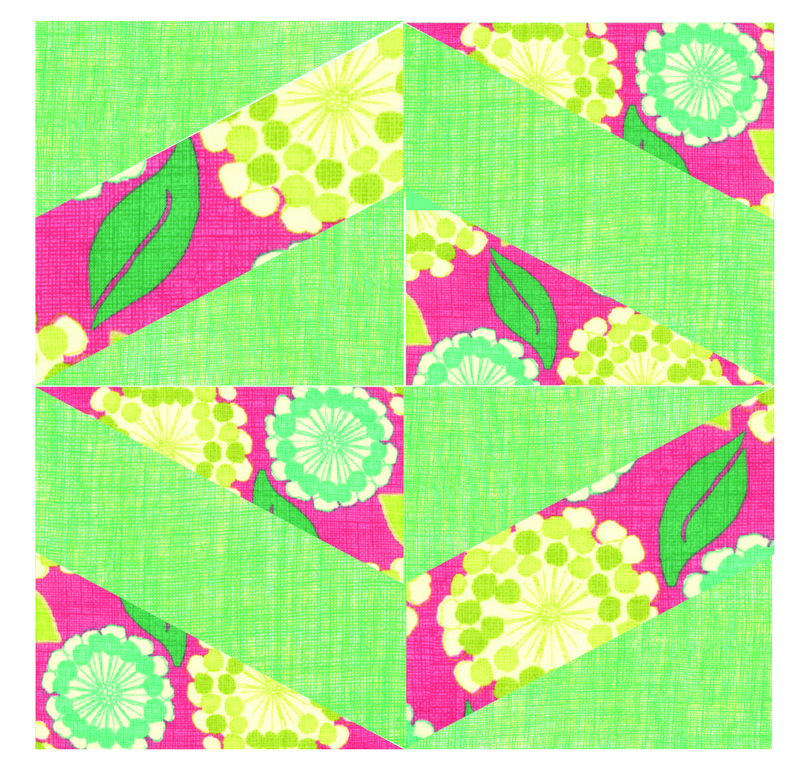 Make 4 Left and Right blocks (shown below). Sew them into one long row. Press the seams between each block open. For the border cut 2 of the 3½”w solid strips the length of the runner. Cut the last 3½”w solid strip into 2 strips the width of the runner. Sew these to the ends and press as before. Layer the backing, batting and runner together. I follow the same method but just kept on going! I made 4 rows of these blocks and sewed them all together & finished them off with a small inner boarder and a larger outer boarder. I can’t wait to try all kinds of different things with this ruler! In your experience do you enjoy using templates? Will you give the Zig-Zag ruler a shot? Thanks for the instructions and the explanations. I’m not sure if I’m visualizing this correctly, but after the zigs and zags are cut out, it looks like there are a number of same-sized triangles left over? 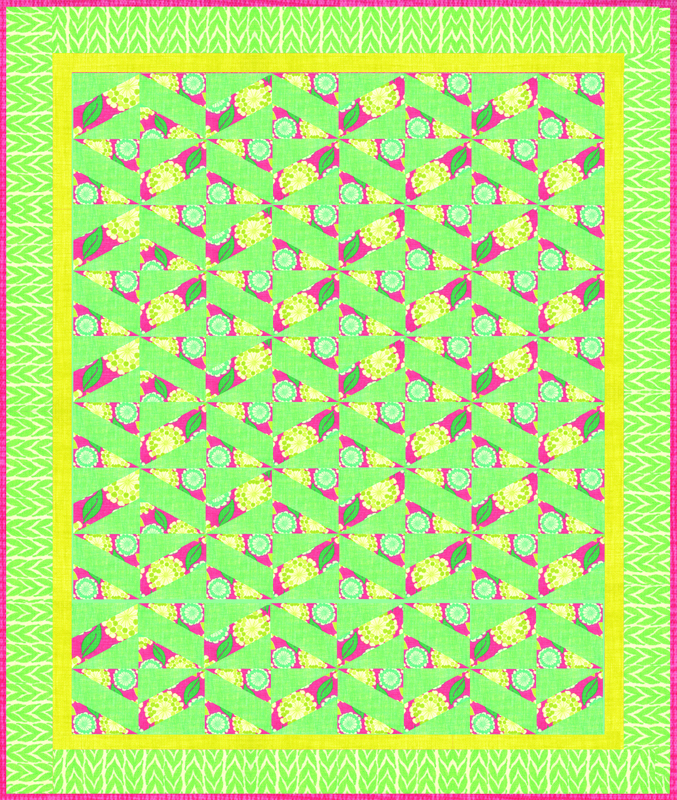 The “Spring House” line is beautiful and very appropriate for this pattern… nice work! Wow! I’ve got the perfect fabric in my stash for this project. Thanks much! This looks like fun! I will have to try it with some of my jellyrolls. I wonder how it looks scrappy…..hmmm I always have left over fabric cuz I buy extra in case of miscuts. Thanks for the good explanation/photo. What a smart idea for more fun designs that we can create. I do use certain templates, but this one is a sure shot as it looks so easy. I’m sure one of my daughters would love a runner (or bigger!) our of this great fabric line. Thanks! Oh yes, this looks like a winner to me. Where can I order the little rulers (both sizes)?